You are in: Home > News > Inclusive Picks up the Top Award Again! For the second year running Inclusive Technology picked up the Education Resource Award for Special Educational Needs including ICT. The 2016 Award was presented at last week’s glittering Awards Dinner held at the National Motorcycle Museum. 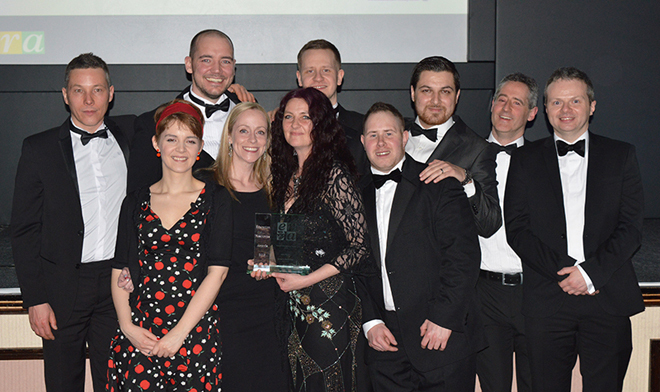 This time ten of Inclusive’s HelpKidzLearn development team took to the stage to accept the coveted trophy for their work on harnessing Eye Gaze technology to the needs of learners with Complex Learning Difficulties and Disabilities (CLDD) with Inclusive EyeGaze Education. “This is a fantastic result for our educators. therapists, web experts, designers, coders, researchers, graphic artists and animators". “We have an incredible team, committed to the needs of the children we serve. Their work deserves every bit of the recognition these Awards give them”. It was back in 1998, the very year Inclusive Technology was incorporated that the then Secretary of State for Education, David Blunkett MP, presented the company with its first Award – The Silver Award for Special Educational Needs. This Award related to the company’s pioneering work with switch accessible software. Since then the company has been looking for evermore direct and intuitive ways for children who face the greatest challenges to communicate, learn, have fun, and lead fuller and more independent lives. Over the years the company has lead with touch technology, interactive plasma screens, accessible apps for iPad and Android. In 2014 the Company swept the board on both sides of the Atlantic winning the top Special Education Awards in Britain and the United States for ChooseIt Maker 3, a classroom tool for creating personalised learning materials. Bringing us up-to-date, in both 2015 and last week in 2016, Inclusive Technology has won the top Special Educational Needs Resource Award for its work with Eye Gaze and the children facing the greatest challenges – now enabled to communicate and take part in learning with this new technology. This ground-breaking work offers learners new capabilities and teachers and therapists new insights into their students’ abilities and progress. If you would like to know more, check out our booklet Eye Gaze in the Classroom.